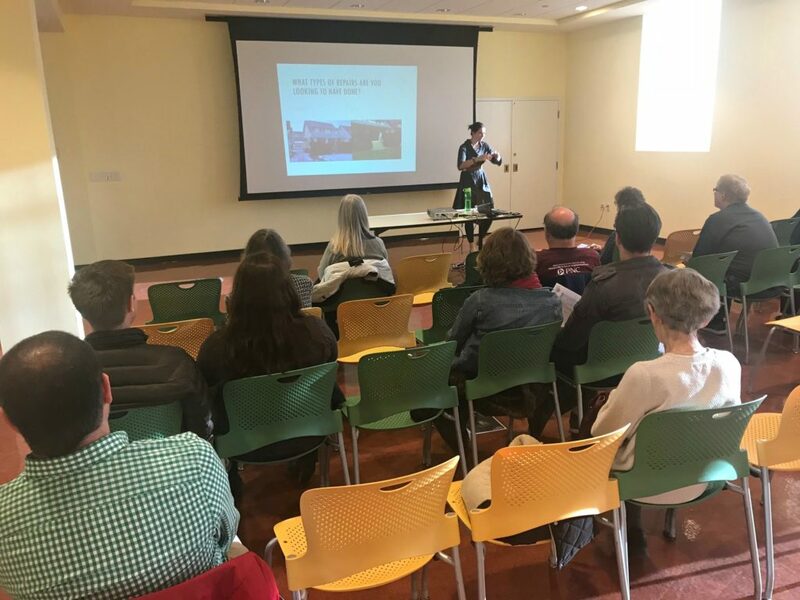 More than 20 area homeowners came to Lakewood Public Library on April 26 for LakewoodAlive’s “Knowing Your Home: How to Contract a Repair” free workshop. Hosted by LakewoodAlive Housing Outreach Director Allison Urbanek, this workshop focused on the process of working with a home repair/improvement contractor. Our “How to Contract a Repair” workshop was hosted by LakewoodAlive’s very own Allison Urbanek. It’s imperative that you learn as much as possible about your project before contracting a repair. Being knowledgeable helps safeguard you from being taken advantage of and guides your vision for a desired finished product. Know where you fall along on the scale of lowest price vs. best quality. Contact the City of Lakewood’s Division of Housing and Building to determine if your repair requires a permit. Utilize LakewoodAlive, Angie’s List or the Better Business Bureau to research prospective contractors, and then check with the City of Lakewood to ensure your contractor is registered. Seek at least two contractor estimates and be sure to request and call references. Your preparedness will ultimately save you time, money and sanity. We can’t stress this enough. When you seek estimates for a repair job, get the prospective contractor to detail the specifics in writing. Have a list of items you want repaired, ask questions and make sure the estimate addresses the full scope of your desired repair services, including any warranties that exist for materials or labor. Doing so helps ensure the finished product lives up to your expectations. An estimate that’s not in writing is like a home with strong curb appeal but a shaky foundation – it might seem fine from the outside but it likely won’t stand the test of time.